Used to craft Ghost Iron Bar and Folded Ghost Iron. Found in The Jade Forest and most other zones it would appear, mining it went green at 555. You can get some extra Ghost Iron Ore per day without farming. There are some special type of seeds which provide crafting materials by planting and harvesting them at Sunsong Ranch (next to Tillers hub) in Valley of the Four Winds. And exactly 200 Sparkling Shards. Ghost Iron seems to be very plentiful in MOP, far more so than Obsidium was in Cataclysm. Thus far, I've found the best spot (pre-90, at least) to mine this to be the northwest of the Valley of the Four Winds zone. There is a range of hills that runs N/S in that area, between The Heartland and Paoquan Hollow. Simply running loops around those hills and you can easily gather 10-15 stacks per hour, even just riding. There's a few enemy mobs at the edge of Paoquan Hollow, but otherwise it's free and clear and safe to mine, even at 85. There are also a lot of spawns within the rocky terraces of The Heartland that are worth checking out. I just tend to wander in those general areas and mining is plentiful. I recently picked up a pair of Mist-Piercing Goggles which are definitely proving their worth - I didn't do any before/after analysis, but I am finding more nodes with them than I did without them. #show will show you the number of ore. If you have more than 5 ore and the macro generates an error, make sure the stacks are in multiples of 5. Also, it's possible to have several "/use " lines in the same macro. Clear your bags of uncut gems. Make macros for each gem (e.g. "#show Sunstone" or "#show Sun's Radiance"
Place the macros on your bar in the same order as in your spreadsheet. Prospect and record the numbers shown on your macros. This information is handy, in conjunction with knowledge of a) market prices of each gem and b) the cost of the ore (in time or money), for calculating how much the prospecting was worth. I prospected 100 Stacks (2000 Ore) of this and thought I would share my results. I use google.docs spreadsheets to help estimate how much money I can make from selling the raw gems. Here is a link if you'd like to use it. TL;DR: It is my understanding that patch 5.4 has broken this route. Please be helpful to your fellow posters and report this thread as out of date. I'm reposting this from the Living Steel thread because it's still the best route I've found for mining Ghost Iron Ore. Although it's directed at maximizing Trillium Ore spawns for the purpose of making Living Steel, the methods I've given and the route I've linked still bring in superior amounts of Ghost Iron Ore due to how much easier it is to "own" each ore node in the route. I needed a ton of Living Steel. Since the only way to make it involved Trillium Bars, I had to find a way to get as many Trillium Bars as possible. There are two ways to obtain Trillium Bars: transmuting Ghost Iron Bars, or smelting Trillium Ore. Both of those methods happen to require you farm lots of Ghost Iron Ore in the most efficient way possible. This is why I'm mentioning this in the Ghost Iron Ore section. In order to get Trillium Ore nodes to spawn, you have to give them some place to spawn. Trillium nodes share nodes with Ghost Iron. If the Ghost Iron spawned in the node, none of the other spots within that node will spawn Trillium. You have to mine the Ghost Iron ore and hope Trillium respawns. To do this in the most effective way possible, you want to mine out the node, go do something else (such as more mining) while waiting for the node to respawn and then come back to the node after it has respawned. Hopefully it will be Trillium. If not, you mine out the Ghost Iron and move on. Plenty of people will probably recommend routes that take you all across a zone. Even if all you're after is Ghost Iron ore, my route still brings in more ore than any other route despite having a higher Trillium to Ghost Iron ratio due to how much easier it is to "own" the nodes on my route. If you intend to farm up Trillium Ore, you need to mine the fewest nodes possible the maximum times per hour. What I'm saying is instead of mining 100 different nodes twice per hour, mine 10 different nodes 20 times per hour. Every node respawn is a chance at getting Trillium Ore to spawn. Assuming every node started out as Ghost Iron, 19 respawns at 10 sites is 190 chances at getting Trillium ore to respawn (getting 100 nodes to respawn only once is 100 chances). Going all around the zone mining everything in sight doesn't allow you to mine the same respawning node over and over again. My route brings in roughly 9 Ghost Iron Ore per minute or 27 stacks per hour. This is approximately 4 and a half bars of Living Steel in materials. Any Trillium deposits you find will only increase your yield (but decrease your Ghost Iron Ore yield if that's what you're after). My route starts in the Tu Shen Burial Ground. There are hostile mobs in the area, but most of them won't bother you and will be busy fighting NPCs. Because of these hostile mobs, a lot of people don't farm here. They see and hear the clashing of swords of the hostile mobs and skip the area. After you've mined out all of the nodes in the area, you have about 30 seconds before the nodes start respawning again. Quickly head up to the Five Sisters, mine up any unprotected nodes and then head back to where you started and start all over again. I have found that a good place to farm these are Windward isle where the Cloud serpent dailies take place at.it is a small area but they nodes seem to respawn quick. i farmed quite a few there even with others there doing the same. i usually just mine around the farming areas in valley of the 4 winds, no mobs. Ghost iron ore is very abundant, but most so in the heartland and the skyrange. Because of this i've been able to gather about 8 stacks of ore while doing just tillers dailies. My best places for gathering ghost iron ore are Windward Isle at Jade forest 65-29 and the top area in Valley of the Four Winds 30-40. The best time is doing dailies in both areas. You can see my captures with the spots. I recommend grabbing the addon: Gatherer. It really speeds up the process. They should stack 100 ._. Gathering mats for engineering I had a go at farming a few different zones for this, and I can definitely say that Valley of the Four Winds was the best. Jade Forest is a close second but gets annoying with all the trees, the Heartland is much better simply because it's easy to see what you're doing and there are a ton of spawns. They seem to appear quite close to each other a lot of the time so it means less time spent mounting up and flying to the next point. If you're planning on just making sha crystals, the multiplier for the most you should pay for ore is 137 if you're going to auction rare gems, and 112 if you're going to craft and DE rares (in other words, it takes 112 ore to prospect, craft, and DE to get enough mats for a Sha Crystal). So, if you're DEing everything and crystals are selling for 500 g, then 500 / 112 = 4.46 g/ore. I know I'm just playing around with the math, but hopefully some of my fellow Excel nerds will find this helpful. An awesome spot to gather a bunch of this quickly is inside the caves at 39.5 75.4 and 37.0 68.2 in Kun-Lai Summit. The cave is quite small, with a bunch of lvl 88 mobs, and it usually contains around 12 veins. You can clean the whole cave in about 5 minutes, gathering around 60-70 ores without any trouble at all. I've discovered one of the most best spots to farm Ghost Iron Ore.
Another spot, where you can find a decent amount of Ghost iron ore is also in Kun-Lai Summit, in a cave, that is located near One Keg camp. It's right above the camp. I've been using Forager's Gloves to save some time by mining faster and Mist-Piercing Goggles to find more deposit in the caves. Though, I flew at the speed of 280%. The rotation I did was simple - Start from those mountains (caves inside of them) from bottom left, then proceed upwards(from map perspective) and then fly to the cave near One Keg. By far the best place I've seen so far to mine ghost iron ore is just west of The Heartland in the Valley Of The Four Winds, its the place where you do your dailies for the Tillers in Halfhill. The re-spawn rate is rediculous. once you go down the ridge and come back up, they all re-spawn. roughly about an 1 1/2 - 2 hours of farming got me about 40 stacks of ore, was a lil over 800 ore. Pretty much just kept goin til my bags were full :P. Hope this helps. Inside a cave in Kota Peak there are deposits literally around every corner. Everyone has their "omg this is the best place to farm (x)", so I'm adding my two copper. Personally, I think Townlong Steppes is the best place for farming ore in general. It is abundant in Ghost Iron, Trillium and Kyparite. So, you get all three types in one shot. It is also an 88-89 zone (for the most part), so at lvl 90 what you're essentially getting is the most bang for your buck, and the least amount of resistance. Many of the nodes are far enough apart from mobs that you can easily grab the node, not aggro a thing and continue on your way. And if you're really into 'farming ore / herbs' than you know that what you're looking for most, is a tight closed circuit loop. You want to spend the least amount of time, getting the most amount of ore. Townlong has some nice easy loops in this regard. Crank the mp3's, farm to your heart's content and barely have to fight a thing. This is my kind of zone. The best place to farm ghost iron, by far is in the jade forest. I got 2 full mining bags and around 20 more stacks of it in around 45 minutes. This means that for each mining bag i got 400 ores and then a total of 1200 ores in 45 minutes. This is very efficient and should not be over looked. Ghost Iron Deposits are found everywhere in Pandaria, and they have quick respawn rates. But I would reccomend the Vale of Eternal Blossoms to farm this ore. The reason being is the number of Rich Ghost Iron Deposists, Trillium Veins, and Rich Trillium Veins. 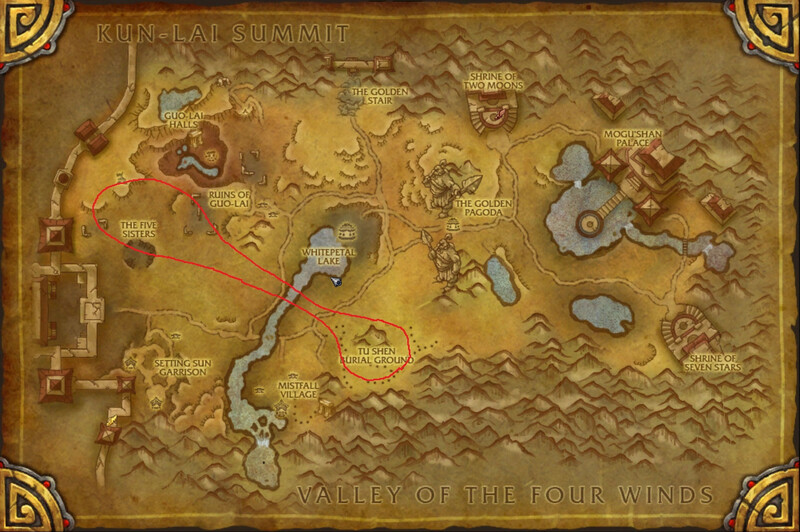 I believe the increased number of the better deposits is because the Vale is the highest leveled place in Pandaria. This being said, I also have noticed the number of Rich deposits and Trillium Veins decrease as you go to the lower leveled places, with the Jade Forest having the fewest numbers. If you guys are about to go farm these ores, I suggest you to have Mist-Piercing Goggles with you, I use it and I can affirm that it does the trick, very useful and providential. Jade forest. Using the Carbonite node route. Without the goggles, trinket or anything. Also has 280% flight speed. Because the mobs are easy to kill and there are almost NO caves at all. I think this is a nice spot. The nice thing about here is. - Nodes have respawned when you're done. - Mobs are level 90.
i got around 1,200 and took around 5 hrs. Of course every server maybe different. On Shattered hand, Kun-Lai Summit is the place to farm. No a lot of competition and the Kota Peak area is bountiful of nodes and Snow Lily If youre a skinner of a Herb picker, the cave at 39, 76 in Kun-Lai is full of skinnable yeti and also Snow Lillies. The best class to mine with would definitely be druid for its very quick shape-shifting. You save an average of 3 seconds for every vein you mine due to your instant flight form. Despite the fact you can now level your mining at level 1, the quickest way is still to buy ore from the Auction House and use Pandaria to fill in for levels you either cannot buy cheap enough ore from or the stages where you can't smelt stuff. For example: today, 11:30 a.m, sunday, one round (skipped all Kyparite Deposits) yielded 273 Ghost Iron Ore, 5 Black Trillium Ore and 17 White Trillium Ore.
My favorite place to farm is definitely Valley of the Four Winds, and since my druid I'm leveling just for gathering purposes (herb/mine) isn't able to fly yet, I've taken to using a macro for mounting and dismounting quickly. I follow the red route and sometimes zig-zag over the farm area. The purple line will yield ore, sometimes trillium, as well, but you usually have to fight mobs. While over the farm area, it's a great time to pick up Dark Soil if you still need rep with the Tiller folks. Following this route, I average about 600-700 ore an hour, and the respawn is pretty quick. I usually start at the western end of the red line, follow it to the eastern end, and then sometimes cruise the purple area while giving the mines time to respawn. I find quite a few Rich mines on this path, as well. With some practice, I'm able to drop out of the sky and land right on the mine I'm after, and then just remount and be on my way to next one. I've found it really handy when "my" route is being heavily farmed. Are you farming for Ghost Iron and/or Trillium and are tired of running in and out of caves in Kun-Lai Summit? Well, get ready to be a troglodyte no more! Head on over to Townlong Steppes where you will find all the ore you need in a tiny radius in the east! Don't believe me? Try it yourself! First of all, be sure that you have on your Mist-Piercing Goggles. Then, start at Fire Camp Osul and travel south-east along the wall. Keep traveling all the way down to Gao-Ran Battlefront where you will go directly west. As soon as you hit the path that leads back north from Gao-Ran, start to head north-west along that path. Continue this trajectory until you're back at Fire Camp Osul. Nodes respawn quickly but are not immediate. You have enough time to stop and kill all the rares you come across without missing a node. If there are no rares to kill at the time, there's your bathroom break. Or, do what I do and keep a battleground queue running while you farm. Drawbacks: Only one person can farm this pathway at a time. If there is someone else farming and you aren't able to successfully run them out of town, you should probably head elsewhere. 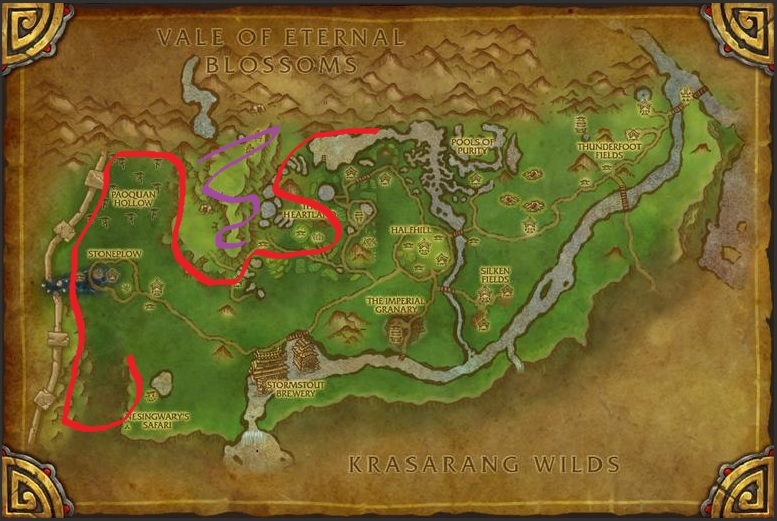 I spent exactly an hour in Valley of the four winds farming Ghost Iron Ore with a farming map found on google search, but honestly you could do it without it as the nodes are literally everywhere. = 1,440g (1368g with AH tax) per hour. 1) You must mine all the ores from the Ghost Iron node you found, so you can't stop at 20/40/60/... if your Ghost Iron node still has Ores inside it. 2) You can't Delete your Ghost Iron Ores. With a miner, an alchemist, and a jewelcrafter, I was stumped as to what product would net the most gold. I'm new to the gold game, so perhaps this is old hat to most of you. I prospected a modest sample size of ghost iron ore and found that the average market price for gems is 294g/100 ore (for my server). I found this shocking and reeeeally wished I had leveled up jewelcrafting sooner! But: I noticed that the price of gems varies substantially across servers, and also that ore and bars seem to be below the alliance average price on my server. You can't even give this ore away it's completely and utterly worthless. When I farm for Ghost Iron, I find myself starting in Valley of the Four Winds. I start from the right of the map, going alogn the Cattail Lake and then toward the wall. Then move up into Vale of Eternal Blossoms before ending my route in Kun Lai at Kota Peak. :) I usually end up with 10-20 stacks within an hour to be honest! Frexima and Nukchuu1 are right. The island is a lot of fun. While mining, you can also do the Cloud Serpent rep quests, find blue presents for the Tillers and discover Balanced Trillium Ingot Plans. I was still getting credit for Darkmoon Grisly Trophies at level 95, so a couple of passes around the island swatting those annoying Slitherscales will get you 10 tickets for the Darkmoon Heirloom vendor as well as a random bunch of greens. Keep in mind that the Valley of the Four Winds might not be as small and easy to fly around and the respawns might not be as fast but the sheer number of nodes in the Valley will mean that you will always have one available. You just need to find it and then get to it. I have noticed that there is some underground nodes of ghost iron near Sri La Village in the 55.0 co-ord area (55.0, 27.1; 55.0, 26.4; 55.1, 29.1) and after looking around I can't for the life of me find any entrance for an underground mine shaft. Does anyone know what the co-ords are for the entrance? Despite what people have said about the Valley of the Four Winds being the best place to farm, I have found the Vale of Eternal Blossoms to be much better for level 90+. I've gotten about 400 ore/hour on this route on a good day. I kinda found the images from this site helpful. So I don't know if this was posted already, but to effectively farm ghost iron ore without getting nuggets, your mining skill needs to be at 490 and I had 912 nuggets before I reached 490 mining skill, which gave me 91 ghost iron ores. You stop getting nuggets at 500. The heartland/halfhill area is always full of glitches and competing farmers ("invalid target", "this item cannot be looted at this time", "internal bag error") and I devised my own great farming route. Basically you start off around heartland/halfhill, but then head north into Kun-lai. I've submitted a screenshot of the map to show the route that I take. Don't forget to go into Prankster's Hollow along the way. This is based on the prospecting of 7820 Ghost Iron Ore and will hopefully give you the tools to decide what to do with your ghost iron ore. On avarage you will get the same amount of the different rare gems as well as the same amount of the different uncommon gems. There will only be smaller discrepancies allowing me to greatly simplify the formula for prospecting. As the prices varies greatly between servers and with time, I choose to make it so that you input the prices yourself so that it will work across all servers. But I can mention that when I did this myself, prospecting was the most profitable with a 47.6 % proffit over just selling the ore and transmuting into Trillium as a Transmution Master came in on second place with 41.2 % over just selling the ore. If you are like me who just learned your mining post BFA from any trainer, you will notice that you only receive one ore/nod and your mining skill is not increasing. Unfortunately I realized that late. Here is what you need to do. Go to Smeltmaster Ashpaw In the The Jade Forest at "/way 46.0, 29.4". Learn your Pandaria Mining and you are good to go. Here is the route that I used and am sharing along with some recommendations and tips for efficient gathering.